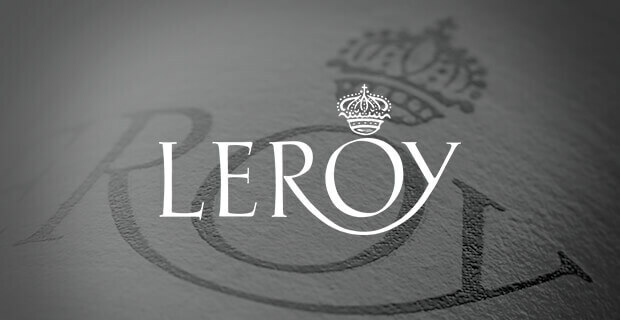 For almost 200 years, the name “Leroy” has been associated with Burgundy wines of exquisite quality. But it was Lalou Bize-Leroy, the great-granddaughter of the founder of Maison Leroy, who established Domaine Leroy and began producing some of the most competitive labels of the region. 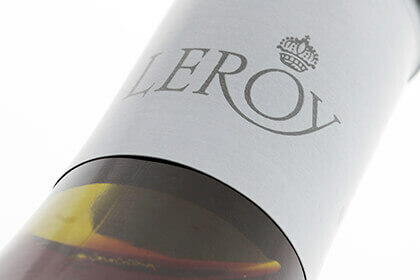 Today, Domaine Leroy is globally recognized for its shockingly low yield of extremely high-quality wines. The estate’s historical vineyard is home to ancient vines, cultivated with 100% biodynamic agriculture. Maison Leroy was first established in 1868 by François Leroy, a winemaker and owner of properties in the prestigious appellations of Auxey-Duresse, Meursault, Pommard, Chambertin, Musigny, Clos Vougeot and Richebourg. His son, Joseph Leroy, together with his wife Louise Curteley, set about to expand the family business by adding distilled alcohols and liquors to the then mostly wine-based profile. Starting around 1897 the Maison began to be widely recognized, receiving several prestigious awards, including the grand prizes of Brussels, Dijon and La Rochelle. Henri Leroy, son of Joseph and Louise, first joined the family business in 1919, expanding it even further by establishing a subsidiary that would specialize in the production of eaux-de-vie alcohol. He also constructed a state-of-the-art distillery in the Segonzac region of Champagne. Perhaps one of Henri Leroy's greatest accomplishments was achieving half ownership of the Domaine Romanee-Conti. Despite his efforts to convince his friend Edmond Gaudin de Villaine not to sell the legendary vineyard after the 1920’s financial crises, Villaine’s brother-in-law and Marie-Dominique Chambon inherited the estate, and the new owner continued selling his shares. Henri Leroy bought many of these shares and, for the 40 years that followed, he dedicated his life to Domaine Romanee-Conti, transforming the estate's flagship product into one of the most famous (and expensive) wines in the world. It was in 1955 that Henri Leroy's daughter, Lalou Bize-Leroy, joined the family business. And in 1971, she became President and Managing Directory of Maison Leroy. Madame Leroy worked tirelessly to study in exhaustive detail the terroirs and climats of Burgundy, in order to fully understand how they could be expressed through certain profiles of wine. She also started a great tradition that would become one of the hallmarks of the estate: a series of very exclusive wine tastings at her home in Domaine D'Auvenay. From 1966 on, the passionate proprietress would invite celebrated wine journalists and critics, restauranteurs and sommeliers to indulge in a tasting of the Maison Leroy range. Some of her distinguished guests included the late Paul Bocuse and Jacques Puisais, President of the Oenologues of France. Throughout the years, it became increasingly difficult to source wines from neighboring growers that would meet the strict standards of the Maison Leroy label. In 1988 Lalou Bize-Leroy expanded the estate’s own vineyards by purchasing a 21-hectare property of Vosne-Romanee from Charles Noellat and another in Gevrey-Chambertin from Philippe-Remy. These vineyards would ultimately become the foundation of today’s 21-hectare Domaine Leroy. She also made the paramount decision to end the use of synthetic chemicals on her vineyards, and to rely on biodynamic cultivation instead. Due to the ceaseless toil of the estate’s passionate owner, by 1988 all the vines at Domaine Leroy were converted to 100% biodynamic agriculture. The soil, seen as a natural ecosystem that must be preserved, is treated with Maria Thun-style compost preparations and cow horns filled with manure instead of chemical fertilizers, pesticides, herbicides and insecticides, which hurt both plants and soil. Furthermore, the soil is tilled by hand, with ridging and de-ridging carried out in order not to compact the soil too much and to encourage organic life in the soil. At Domaine Leroy, vines are replaced, one-by-one, by young plants grown from the buds of sister vines taken from the same vineyard. Like this, the vines are like members of a family, with various ages and developmental stages. A biodynamic calendar is followed in tending to the vines, with guyot pruning carried out only on days when the moon is passing the constellations of Sagitarrius, Aries, Leo and also Aquarius, Gemini and Libra, if necessary. After pruning, the cuts are treated with a biodynamic wash to help them heal faster. The vineyard is managed on a vine-by-vine basis, with selective ebourgeonnage (de-budding to limit yield) and ejetonnage (removing buds growing on the trunk) carried out wherever necessary. In order not to cause additional stress to the vines, the vineyard team avoids clipping or trimming the ends, keeping the apex, or the last bund on each branch. A wide range of different teas and herbal mixtures are applied to “feed the soil,” and the type of mixture applied to each parcel depends on the individual needs of the wine made from it. The extensive and very selective pruning and crop thinning results in very low yields (16hL per hectare, on average) of extremely concentrated, high-quality grapes, some of Burgundy’s best. The fruit is sorted twice by hand - first on the vineyard, then again at the winery. Upon arrival to the winery, the grapes are sorted on two large sorting tables, allowing the team more time for careful selection than would a moving conveyor belt. Without first being crushed or destemmed, the whole-bunch fruit is transferred to large wooden barrels for alcoholic fermentation. Through this practice of minimal involvement, the precious native yeasts growing on the grape skins, are preserved and allowed to do what they do best. The fermentation process is slow and steady with a very long maceration period. During this time, the winery team carries out both pigeage (punching down of the pomace formed by the skins and seeds) and remontage (draining out the fermenting juice from under the cap and pouring it over the top). The fruit is then gently pressed and the wine moved to the first of two subterranean cellars, where it undergoes malolactic fermentation. 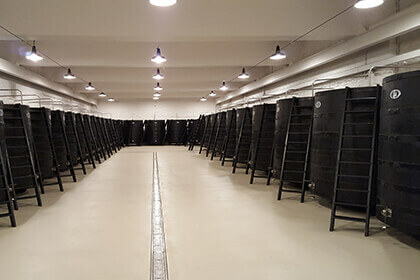 After the wine is poured off the lees, it is moved to the second underground cave. 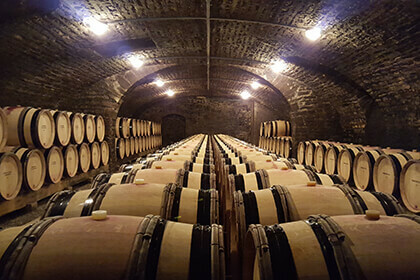 In this deep and cold cellar, the wine remains, maturing until it is ready to be bottled. 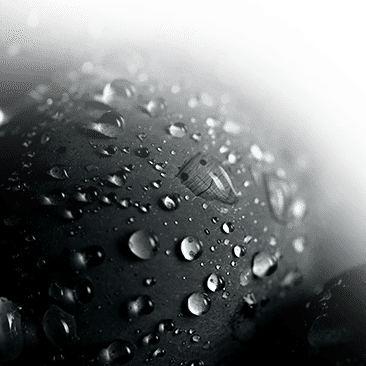 Throughout the entire winemaking process, the must and wine are moved through the winery exclusively with gravity-fed systems, without the use of pumps, in order not to harm the liquid in such a delicate state. The wines are never fined or filtered before bottling. Domaine Leroy is considered by many neighbouring Burgundy producers to be controversial for the extremely limited quality of wine produced under each label. The estate definitely brings new meaning to “quality over quantity.” Currently, Domaine Leroy own property in 9 Grand Cru appellations, 8 Premier Cru appellations, 9 Village appellations and several Burgundy appellations as well.